"A passerby tries to prevent rain from hitting her in the face as heavy rain and strong wind blow on Calvert Street in Baltimore City, Thursday, April 28, 2011." I am not sure why I like this frame yesterday, but I do. After a doctor's appointment, I grabbed some breakfast and then sat on Federal Hill. 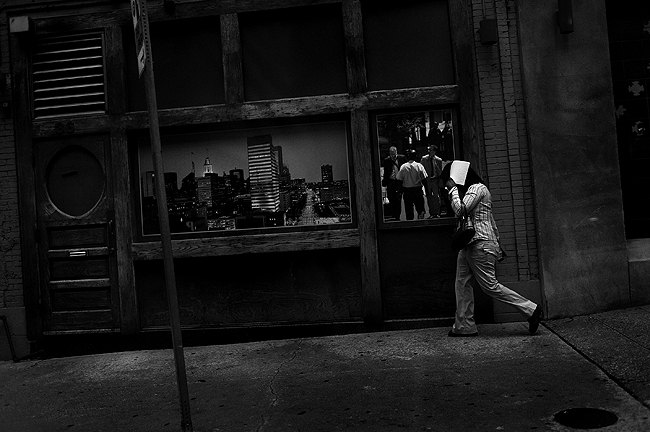 From there, I thought I'd shoot some street photos before the wicked storm. It was a mix of either a group of people, or completely deserted, as strong storms rolled through. I didn't last long not having a rain coat on me. As I got in my car, the rain really started to come down. Driving north on Calvert, people began pulling out umbrellas and such. I have a bad tendency to shoot pictures when I am driving, which should be a series of photographs of mine by now. This woman caught my eye, as she attempted to prevent the sideways rain from pelleting her in the face. Just so happen I wasn't paying attention and severely underexposed the frame. But for some reason everything came together. I still can't explain it, but I guess that's what a lot of time makes a good street photo to me - the curiosity and randomness that is the street. More street stuff to come. "An umbrella tumbles across Elm Avenue at the corner of Wellington Street in the Hampden neighbor of Baltimore City, Wednesday, April 20, 2011." My friend scored some free tickets to the ballgame last Wednesday, so we ventured to Camden Yards. The temperatures hovered in the mid-80s and made for a interesting afternoon and evening. I had not been to a baseball game as a fan in Baltimore since I was probably eight-years-old. Every other visit has been work related. Instead of being crammed into one of the photo pits, I was 15 rows behind home plate filling my stomach with beer and snacks. This is a quick glance of what crossed the graces of my lens for a couple hours leading up to and at the game. Most were mindless snaps of whatever I glanced at. 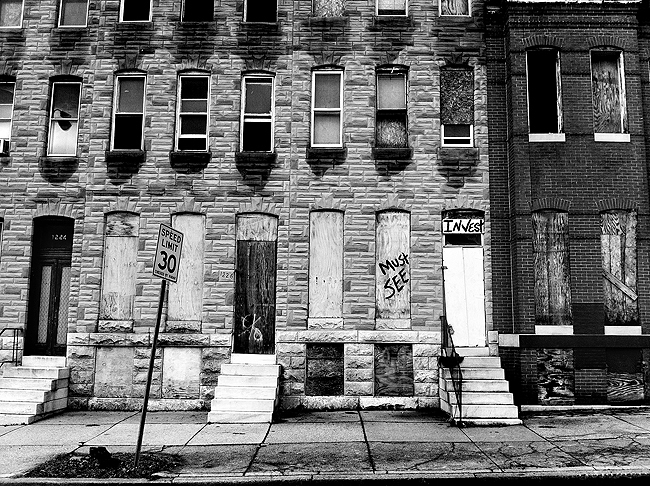 "A typical view, a row of vacant homes are boarded up in East Baltimore City, Wednesday, March 16, 2011." My view old daily view - beautiful mountains in Utah - has been replaced by rundown, empty and boarded up vacant homes in Baltimore City. Much to the liking of the song title of LCD Soundsystem, I've revised it for an ongoing photo project: "[Baltimore], I love you but you're bringing me down"
Don't color me ugly, the city is full of character and is unlike anywhere else. I love it - I do. But it's depressing all at the same time. This ongoing project will feature whatever intrigues me, but fits its title. 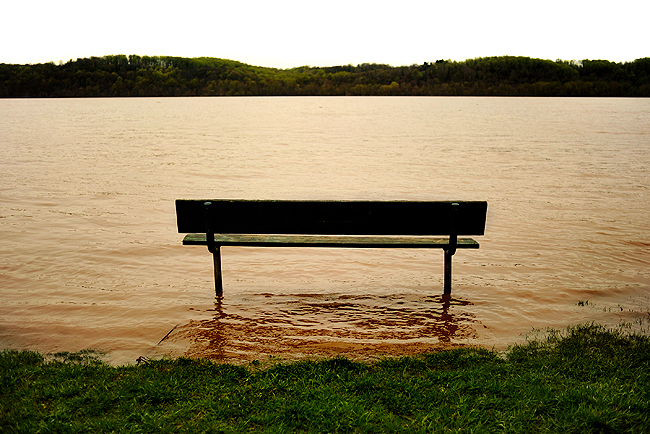 "A bench sits in the water of the north bank of the Susquehanna River near its discharge into the Chesapeake Bay in Port Deposit, Md., Monday, April 18, 2011." Thought this was an interesting scene of the Susquehanna River. Days earlier we had some heavy rains which I had thought muddied the waters as I passed the Conowingo Dam from Harford County into Cecil County. However, the dam was open, and water levels were very high. Had it been a warm, sunny day, I may have taken off my shoes and sat there. Then again, the perch may have nibbled at my toes making it uncomfortable. 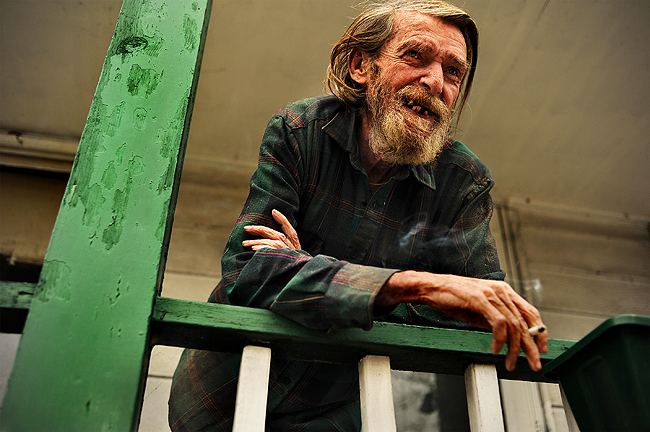 "On the porch of his home, Jackie Bittner laughs with an old friend, in Port Deposit, Md., Monday, April 18, 2011. Celebrating his birthday, Bittner has lived in Port Deposit his entire life, moving less than 100 feet from the home he was raised in." As I've mentioned, I've been venturing out to shoot whatever interests me - and generally that's people. It's good exercise I need, and it's a confidence booster since I've been out so long. As a friend said to me, "The world can take everything, whatever it wants, away from you, but they can never take your talent." On the agenda today, the town of Port Deposit. I've driven through this historic town more than I care to remember, but I've never walked more than 50 steps on the main drag. So I made the pilgrimage there, parked at the south end, and started walking north. It's amazing how little I shoot when not on a deadline. I shot less than the equivalent of two rolls of film and bumped into a lot of friendly folk, including Jackie and his old friend John. I spent about 30 minutes talking with the two, who are life-long residents of the town. I learned a lot of the town, and Jackie, who was celebrating his birthday. Promising Jackie a print, I'll be sure to be back. I also am waiting to visit a certain place nearby once warmer weather breaks. "Standing with his dog, a man talks a boardwalk entertainer in Ocean City, Md., Saturday, April 2, 2011." The boardwalk is one of my favorite places to visit when I go to Ocean City, Md. In my humble opinion, there is nothing more interesting than ourselves - people. Sitting on a bench, walking or pedaling on the boards bodes well for my eye balls. It makes me happy. My camera clicks a lot. There are literally all walks of life. However, when it's considered the off season, weeks before Memorial Day when the beach begins to breathe a new life of excitement, things can be boring. The warm weather transforms the boredwalk into the boardwalk. There were some sights to be had during this short visit, but with very, very little warm bodies there - it was lack luster. I'll be sure to go back soon once things ramp up and maybe live under the boardwalk for a couple days. Alas, here are a couple that stuck with me. 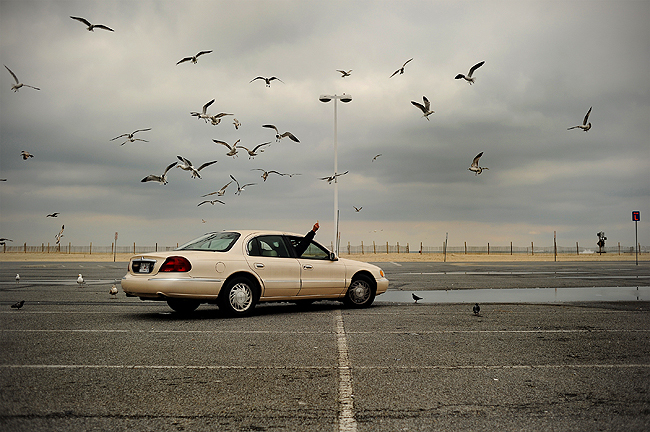 "On a rainy afternoon, a visitor feeds masses of seagulls at an empty inlet parking lot in Ocean City, Md., Friday, April 1, 2011." Ocean City breeds an air of familiarly for me and always will. I was fortunate enough to be raised by the water from the time I could breathe and blink. Every time I visit, there is something about the entire city that makes me nostalgic. The sticky feel of sea air as you hit Delaware, the sand between your toes, the comfort seafood, the lingering scent of caramel popcorn, and the smile it all brings to my face. I can walk by dozens on dozens of businesses, recalling times of my youth and wishing I was still living a carefree lifestyle. No stress. No struggle. But life moves forward. We grow. We learn. We move. Our perspectives change. No longer are the the small three-foot waves appearing as massive tidal waves. No longer are the slices of pizza bottomless and free. No longer do weekends feel like entire weeks. No longer must we wake and provide. But even though these perspectives shift and take new form in our lives, we can still let go and discover new treasures beneath the sand. As I spent a pair of days this weekend roaming the boardwalk, and driving down coastal highway, I tried to see things in a new way, despite being drawn toward my past memories. It was a great weekend where I found myself forgetting about the tough times I've endured these past couple months and the time there really lifted my spirits about returning to work and the future.